Perhaps I could mention that using twitter to build PLNs advocates authentic peer driven learning and professional development, while breaking down silos and reducing learning isolation. Moreover, that twitter allows visibility of practice, fosters global connectivity, promotes engagement, energizes personal learning, and somehow humanizes a virtual world by providing collegial support in an online environment—but that’s already been done. The SCH Academy twitter workshops have been successful these past few weeks. User-ship has grown to point where we have close eighty SCH tweeps—increasing daily. Click on the SCH Academy Learning Leaders list to start following colleagues, and let’s continue building the community. If you don’t yet have an account—create one. Below is a link to the a short presentation that will get you started in minutes…briefly explaining hashtags, Tweetdeck/Hootsuite, what educators should and should not be tweeting about and more. 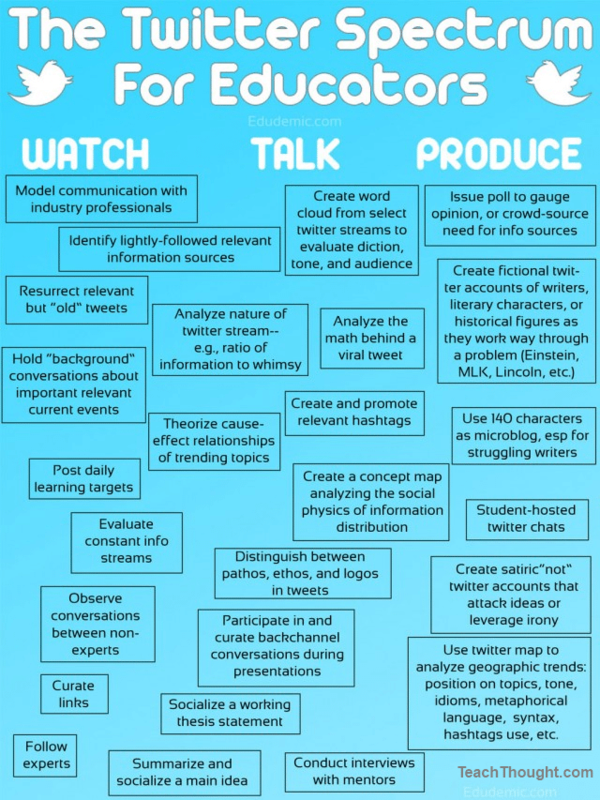 Another terrific resource is a collaborative effort between Edudemic and Teachthought where they produce the following spectrum for using Twitter in the classroom. Produce, which implies an even greater interaction between an audience, a purpose, and a media design–in this case, using twitter to actually produce something original. Thanks for reading…Tweet on folks! This is great, Vince. I find that Twitter is best for some things, FB for others, etc. Thanks, Martha. Have been following your Tweets, great stuff!